PHILADELPHIA -- Let's call it the "silly season." At some point during every Stanley Cup Final, there seems to be some goofy story angle that emerges. In 2010, it's Chris Pronger swiping pucks at the end of the game, presumably to deny the Blackhawks from having a memento of a win in the Final. "I didn't even know he took the puck until I saw that clip this morning," Blackhawks forward Patrick Sharp said. "Doesn't matter to me. I didn't think twice about it. If he wants it, he can have it. We're thinking about hockey between the whistles and during the 60 minutes. So if he wants it, he can go grab it." "I found out about it today," Flyers coach Peter Laviolette said Tuesday. "I read about it. I think it's kind of comical. If Chris Pronger wants the puck, then he can have it, as far as I'm concerned. I don't have any problems with that. I don't know what the big deal is." Exactly, it isn't a big deal, but in terms of the psychological warfare that goes on in the Final, between the teams and between the teams and the media, Pronger has been a howling success with "puckgate." Why? Simple. The Flyers, obviously, are trailing in the Final, down 0-2 heading into a vital Game 3 at home Wednesday (8 p.m. ET, Versus, CBC, RDS). Do you think Pronger and the rest of the Flyers want to dwell on the negatives of Games 1 and 2 at every meeting with reporters and TV crews? Nope, not a bit. So, Pronger steps up, snatches the pucks in Games 1 and 2 and creates a storyline that has nothing to do with the team's goaltending, scoring, penalty killing, power play or anything else pertinent to winning a game. He has deflected the attention on to something silly and because he loves the give-and-take of the press conference setting, the focus has gone to him and away from teammates who now can prepare in peace. Remember, Pronger is a veteran at all this hub-bub, so it doesn't bother him in the slightest. "Like I said a couple of days ago, he's always in control," Mike Richards said of Pronger. "He seems like there's a sense of calmness about him in any situation. Whether it's on the ice or a minute left or just being around the dressing room, he has a sense of calmness. I think with a young group like we have, an inexperienced group like we have, I think that calmness about him rubs off on different people. It's definitely helped out a lot of the younger people." And swiping a couple pucks is all part of the plan. Holland on OT -- NHL general managers are meeting in Philadelphia Wednesday to go over a number of subjects. Detroit Red Wings GM Ken Holland told the Detroit Free Press he wants to see a change in the NHL's overtime format. "I'd like to see more games decided in overtime than shootout,” Holland said Tuesday. "I don't mind the shootout, I just don't want the shootout to decide so many games. "My suggestion is, extend OT from five minutes to eight minutes or from five minutes to 10 minutes," Holland said. "Then maybe do we go half of it four-on-four, half of it three-on-three? "I just want to have a conversation to see if other people feel like I do." Depth pays off for Hawks -- Don't ever underestimate the value of depth in a lineup. Look at the Blackhawks, they have really been successful because they can roll four lines and three pairs of defense while having players waiting in the wings if there is an injury -- See Tomas Kopecky taking over for Andrew Ladd and scoring the winner in Game 1. "We've got some depth in our lineup," Chicago coach Joel Quenneville admitted. "We've had some guys that when we make up lines, we feel a lot of guys can play with anybody. I think we have a lot of interchangeable parts. We've got a lot of high-end players that can make plays and have patience with the puck. Some guys have maybe a little more skill level than others, but I think they're all able to score. I think that's what you see in a lot of playoff series. The guys that get most of the attention sometimes aren't the guys that are being productive. I think a guy like (Marian) Hossa all year, we were talking about him throughout the playoffs and his production, but his effectiveness is what we appreciate, his contribution to our team game. Now he's all of a sudden on the score sheet, but he does a lot of things to enhance our game. "The thing that we like about it going into games is we don't care who scores, but there's a lot of options. We feel all four lines can score." One at a time -- How do the Blackhawks combat any overconfidence of being up two games in the Final? 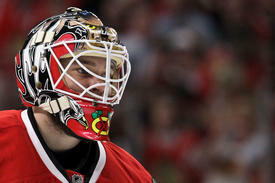 "Our focus is on one game," Joel Quenneville said Tuesday. "Tomorrow's going to be our toughest game, and they're going to be ready. We're looking for the perfect road game. We have to play the best game we've played all playoffs. "We feel we can still move up in the first two games levels. That's our focus and our mindset. We don't want to get further than that and looking past tomorrow's game. Our mindset is we want to win that game like we have to win." Here comes the roar, again -- Chicago was a treat in Games 1 and 2 because of the crowd that makes the United Center sound like a jet propulsion laboratory. Philadelphia's Wachovia Center also will be a wall of noise. "We've played in some big hockey markets in Vancouver and San Jose," the Hawks' John Madden said. "The crowds have been unbelievable. Obviously at home in Chicago it's been great. We've had that question asked a lot. Now, coming to Philly, I haven't played here a lot, but from Sharpie (Patrick Sharp) and Eags (Ben Eager) and a few of the guys that have played against the Flyers, you know, it's a fun barn to play in. You know, the crowd's going to be a lot of fun. "I have no idea how many times that question's been asked, but the building here is great," Chicago defenseman Brent Seabrook agreed. "It's a fantastic building to play in. I think it can play to a team's advantage, especially Philly's. If they're playing well, and the team's going well, their fans will let them know it. So it can be to their advantage for sure." The wait continues -- The Flyers' focus for Game 3 is to put a lot of pressure on Chicago goalie Antti Niemi and see if he wilts. Patrick Sharp says good luck with that plan. "It seems like all season people have been waiting for Antti to slow down and show he's a rookie," Sharp said. "It seems that he's been getting better and better all season long. I know he's definitely got the confidence of us as a team in the locker room, and I think he's starting to prove to everybody else what kind of quality goaltender he is. "So to score goals in the playoffs it's no secret, you've got to get to the net, and get puck and bodies there and disrupt the goaltender as much as you can. We're not surprised by those comments. I guess we're going to try to do the same thing to their goalie."